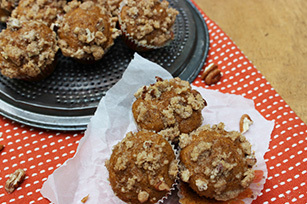 Bake up some Mini Pumpkin Streusel Muffins today. These scrumptious Mini Pumpkin Streusel Muffins are completed with a spicy, nutty streusel topping. COMBINE flour, baking powder, pumpkin pie spice, baking soda, salt and cinnamon. Set aside. COMBINE in a large bowl the wet ingredients; pumpkin, sugar, oil and eggs. Then combine in small bowl ingredients for topping until crumbly. PREHEAT oven to 350°F and place cupcake liners in a muffin tin. Divide batter into liners using a cookie dough scoop, add about 2 tablespoons. Sprinkle with topping. BAKE for about 10-12 minutes or until a toothpick inserted in the center comes out clean.